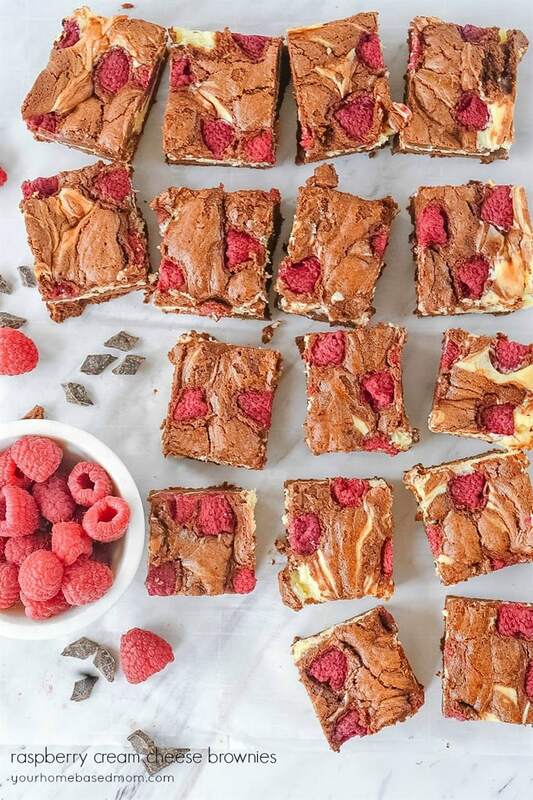 These raspberry cream cheese brownies are divine. A perfect combination of flavors. Over the years, I’ve done the food and cooking for a lot of church events, especially luncheons and dinners for the women’s group. Several years ago, I did the menu for a women’s meeting and we decided to do a dessert bar. I worked hard coming up with the perfect dessert menu for the event and I did a lot of experimenting too. We decided we didn’t want to have to deal with utensils so we wanted all the desserts to be finger foods, things you could just pick up and eat. 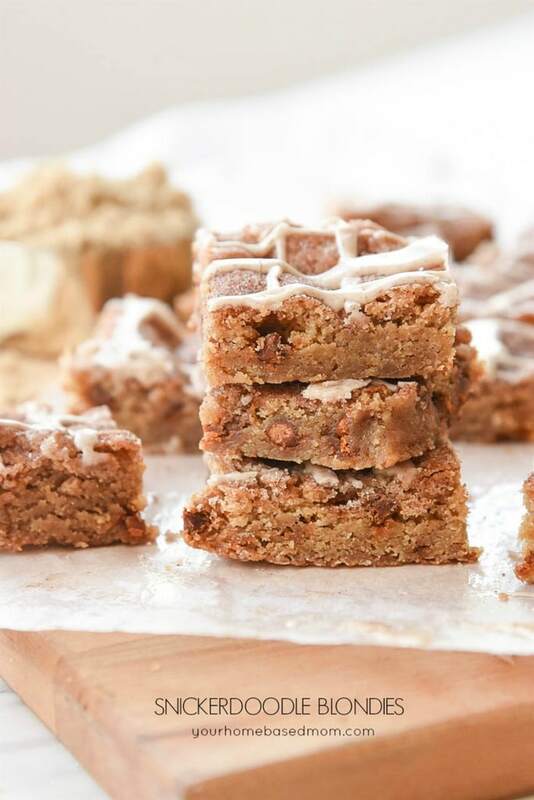 These yummy Key Lime Bars definitely made the cut out of all the recipes I tested and so did this recipe for raspberry cream cheese brownies. I knew that chocolate had to be part of the dessert menu. What would a church event for women be without chocolate?!? A member of my food committee for the event shared this yummy recipe with me. Not only did it make the cut but it was definitely one of the most popular items on the dessert bar. You know it’s a good one when you get lots of requests for the recipe. Believe it or not I’m not a fan of a lot of chocolate. 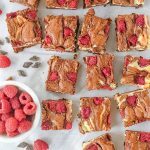 I like my chocolate combined with other things and the combination of cheese cake, raspberries and chocolate in these bar cookies is perfection. These bars start with a brownie base and then are topped with a cheesecake like mixture. Let your cream cheese sit out for a few hours to make sure it is nice and soft before mixing. You don’t want any lumps in your cream cheese! Top your brownie base with the cream cheese mixture and then add the remaining 1/3 cup of brownie mixture on top by the spoonful. Take a knife and swirl through the brownie mixture and the cream cheese. Add your raspberries on top and gently push them into the mixture. Allow to cool before cutting and if there are any brownies left at the end of the day, refrigerate them overnight because of the cream cheese. Yes! I’ve used fresh and frozen raspberries and they both worked fine, just make sure to thaw and drain them if they were frozen. What is the easiest way to cleanly cut brownies? Allow brownies to totally cool to room temperature or chill in the refrigerator. Use a disposable plastic knife, the kind you just throw away. A friend of mine shared this tip with me a few years ago and it works! If the knife picks up any crumbs while cutting just wipe them off before your next cut. 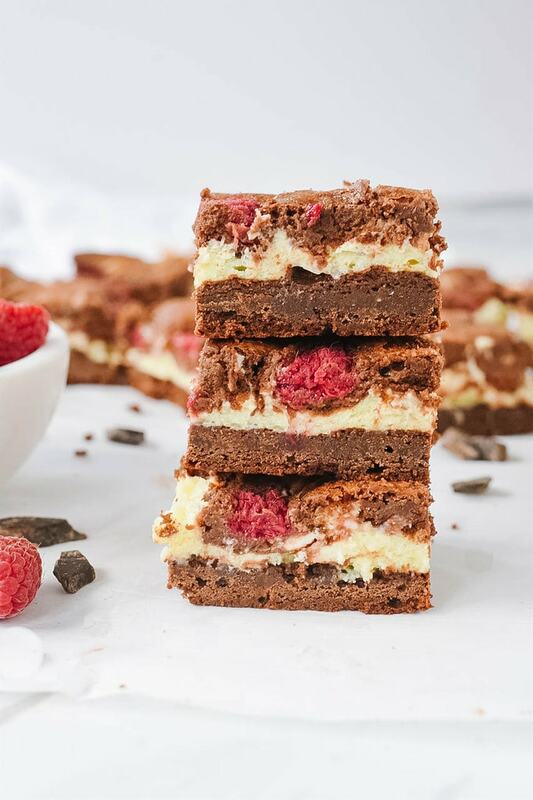 The delicious combination of raspberry, chocolate, and cheesecake all in a yummy brownie. How much of the brownie mix on the bottom? 12/3? Do you mean 1/2 of the mixture? It sounds so good I do not want to mess the recipe up. Thanks. I am in LOVE with your blog!! 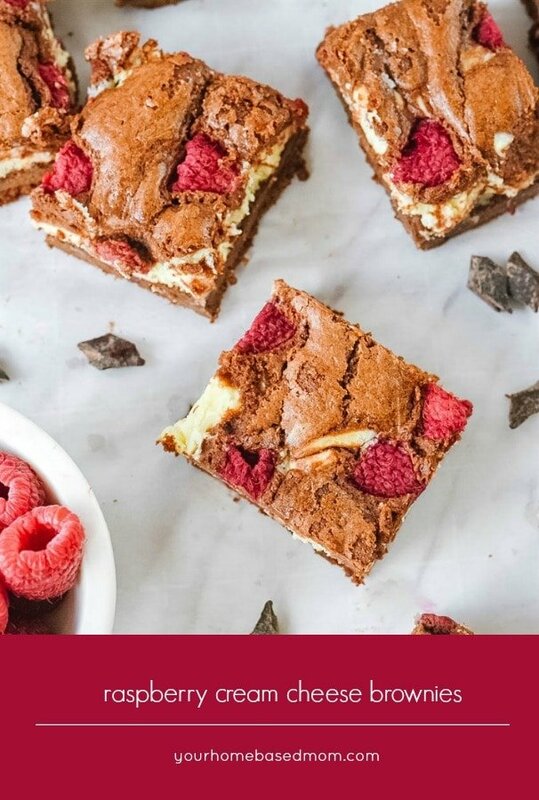 I love the recipes and I plan on baking these brownies for my boyfriends birthday this weekend. Thank you for this post!! OMG. Yum!!!!!! 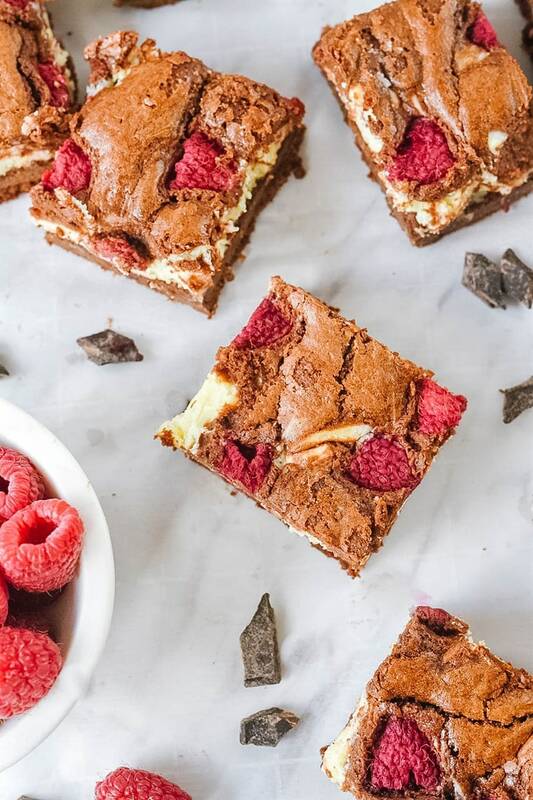 Chocolate & Raspberries are two of my favorite combinations…throw in cream cheese and I’m in HEAVEN. I’m so making these VERY soon. Thanks for sharing! a great dessert (From Kayotickay). Betcha can’t just eat one!!! OMG! These look so good. 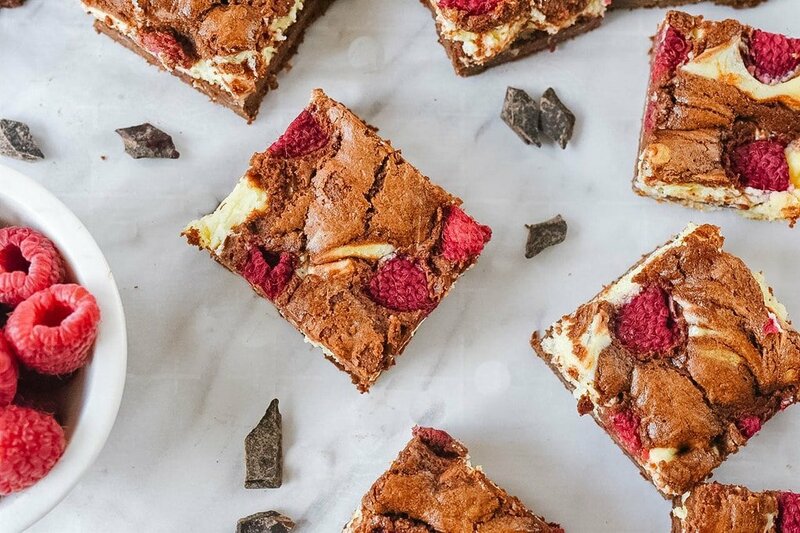 Chocolate and raspberries are a perfect combo. Thanks for sharing. These brownie look wonderful! Those church ladies sure are lucky to have you helping with their event!! Im confused on the chocolate. Do you mean 7oz of a chunk of chocolate? Or chocolate chips? Or chocolate powder? How did you measure 7oz of it? Leigh Anne, what a great recipe and not that many ingredients either! I’m sure the fresh or frozen raspberries would be best but wonder if preserves or jam might work in a pinch? I clicked on the Duth Girl Cooking link and loved seeing her photography and recipes. I wondered at first if she was an American living in the Netherlands as her English was so good. Then I saw a “translater” at the bottom and clicked on it randomly and was reading in Danish! Then I changed it to French. Amazing! I can see I have a lot to learn in the blogging world. Thanks for leading the way. Can’t wait to try these. I looooooved the Key Lime Bars. I was the hit of the teacher’s lounge this week. Thanks for being so generous with the recipes. I did use a chunk of chocolate but you can also use those baking squares they sell in a box. Each of the squares is 1 oz. I’m wondering – how much exactly is 7 oz. of butter? What about 5 oz. of raspberries? I guess I never think in terms of oz. – my brain doesn’t go there (unless it’s liquid ingredients). One cube/stick of butter is 4 oz. and for your raspberries you will just need to look at the package when you buy it and see how many ounces it says. For liquid 8 oz. is a cup. 1. Do you melt the butter or just cream it with the sugar b/4 adding the eggs? 2. For the chocolate, are you referring to chocolate almond bark? Would that work? I’m kind of new at this so I apologize if my questions seem obvious! I used the baking chocolate you can buy in the baking aisle. It comes in a box and is in individual 1 oz. squares. Trader Joe’s also has big blocks of chocolate. I wouldn’t use almond bark as that is not real chocolate. Yes,you melt the chocolate. I did it in the microwave or you can do it in a double broiler. How nice to hear from you! Do you write in English? It seems it would be hard to write recipes and measurements in a second language. I loved your blog! Hi Marti! Yes, I write my blog in English—I’ve been blogging in English for over a decade now. I have a huge predilection for volume cooking, so it’s pretty much a second nature. I made these and took them to a Girls Night Out in my neighborhood. Oh my word…they are fab! Everyone loved them. 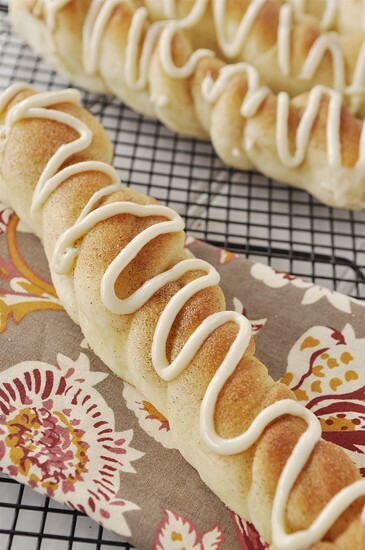 Very easy to make and a real crowd pleaser. 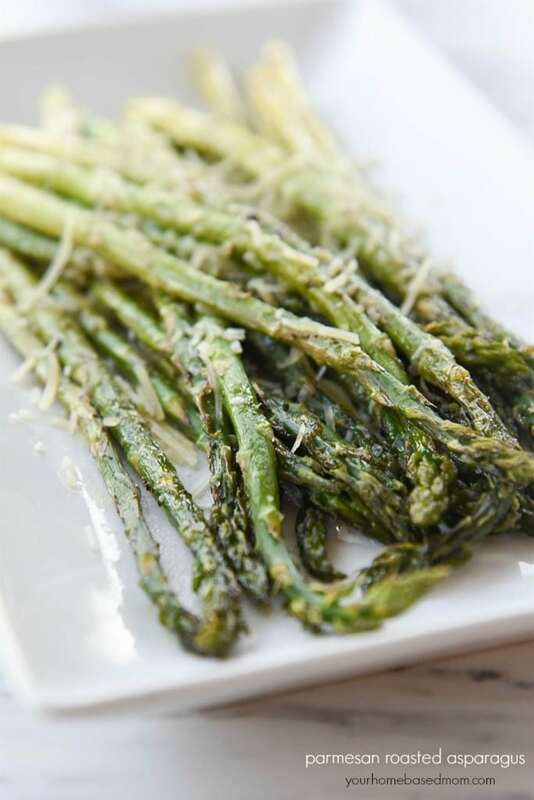 When I want a new recipe I just look at your blog and ALWAYS find something delish! Ok…I made these again for my family only this time I used fresh raspberries. I thought they were better this time because the raspberries were sweeter. Wonderful recipe! I’ve made these twice and they have been a HUGE hit. The only problem I have is that I just can’t seem to get them to look as great as yours do. The brownie mix sinks to the bottom when it bakes so I don’t have the “sandwich” look that you do. How do you do this? Not sure why that is happening for you. After everythiing is in the pan (except the raspberries) I just use a knife to gently swirl everything together. Mine didn’t look just like the photo from the original blog where the recipe came from either! I’m glad they tasted good though!! I tried this recipe and it was very good. I need to work on my marbling skills because the batch that I made were definitely not as pretty as yours. It didn’t bother me too much because they still tasted very good. Thank you for sharing the recipe. I can understand Emily G’s questions. I, too, looked for DARK chocolate in the baking aisle. I finally had to get them in the CHIP version (60% bittersweet), because I couldn’t find baking chocolate that specifically stated “dark”, and I wasn’t sure if the “unsweetened” baking chocolate that I have is the same or not — or if it’s more along the MILK variety. Our store does carry dark baking chocolate (the type in the squares) Maybe it’s a regional thing?? I would use semi sweet if I couldn’t find dark. 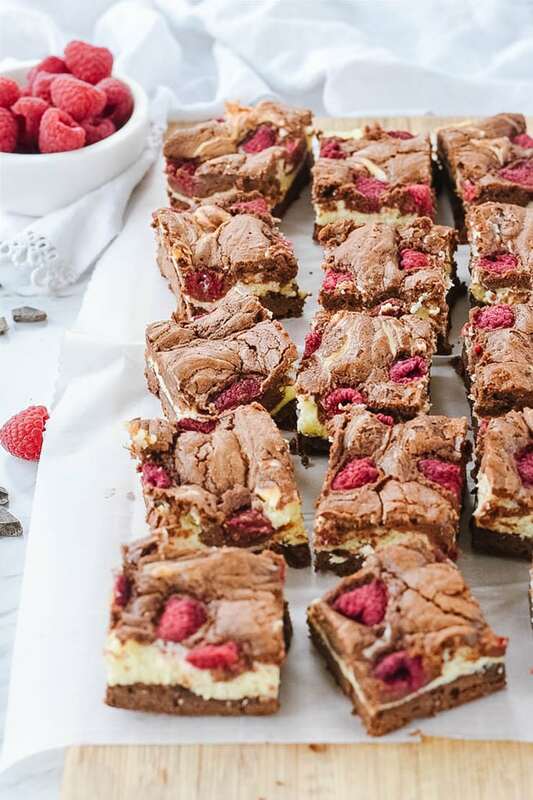 I’m making both the lime bars and these raspberry cheesecake brownies for a church event next weekend. Do you know if they freeze well? I’ve got a lot of baking to do, and would love to do a little each day! Also…what other bars did you decide to do for your event last year? Your recipes always save the day! (making the spinach chicken salad for RS broadcast this month…). Thanks! I made these for my food technology at school and they were my most popular product 🙂 was wondering, would they work with white chocolate? and strawberries? I’ve tried once and they were okay, much sweeter though. What do you think? Becca, I am not a huge fan of strawerries afte they have been baked so personally I don’t th ink I would care for it but white chocolate and raspberries is a favorite combination of mine! Let me know if you give it a try.